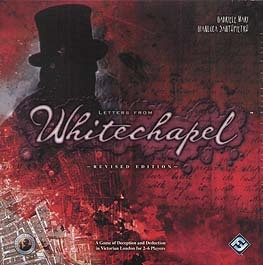 In Letters from Whitechapel, one player assumes the role of Jack the Ripper while the other players assume the roles of detectives pursuing him in Victorian London. Jack the Ripper must outmanoeuvre the detectives in the tangled streets of the Whitechapel District to escape after committing his horrible murders. Meanwhile, the detectives must use clever deduction and their superior numbers to hunt Jack the Ripper down before he can kill again or elude them forever. Will history's most notorious serial killer get away again? Or, this time, will he be brought to justice?